Dr Mandegar was born in 1954 in Tehran. He completed his primary and secondary education in Tehran before entering Tehran University to study medicine. 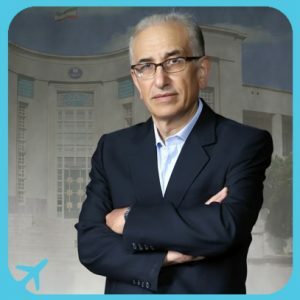 Dr Mandegar finished his general medicine degree in 1979, as part of which he completed a clinical course at Imam Khomeini hospital and his internship at Ruzbeh hospital in Tehran. He then continued his education in general surgery at the same univesrity and passed his residency term at Sina and Imam Khomeini hospitals. While Dr Mandegar was passing his residency, there came the Iraq-Iran war. He went to the frontlines of the war to serve the wounded people in a field hospital. During the war, he came back to Tehran to pass a 3-year course in heart surgery at Imam Khomeini hospital under the supervision of the best heart surgeons including Dr Mobarhan, Dr Ameli and Dr Rahbar, and then he went back to the war zones to help the injured soldiers, this time with more experience and expertise. He graduated in 1987 in heart surgery after successfully passing the board certification exam. He became an assistant professor at Imam Khomeini hospital and after a year he received a scholarship to continue his studies abroad. He applied to the University of London and got accepted to pass a heart surgery programme at Guy’s hospital, affiliated to this university and a well-known hospital in heart surgery. After that, he went to the United States to pass a fellowship at Texas Heart Institute and a few months later he returned to London to become a registrar in Cardiac Surgery at University of London, United Kingdom. Dr Mandegar returned to Iran in 1991. Dr Mandegar became an assistant professor of cardiac surgery at Dr Shariati hospital in 1995 and then in 1997 he was promoted to an associate professor. In 2008 he became a full professor of cardiac surgery and has maintained his status until now. ِDr Mandegar did the first successful Aortic Homograft Valve Replacement in Iran in 1991. Two years later, he successfully performed the first heart transplant in Iran in 1993. Dr Mandegar established the Institute of Cardiovascular Surgery of Dr Shariati hospital in 1991. He has been a member of the cardiothoracic associations of Mediterranean region, Europ, and the US since 2000, 2001, and 2002, respectively.